Easily create custom map sizes, add external map types (scripts) - No xml file modifications. 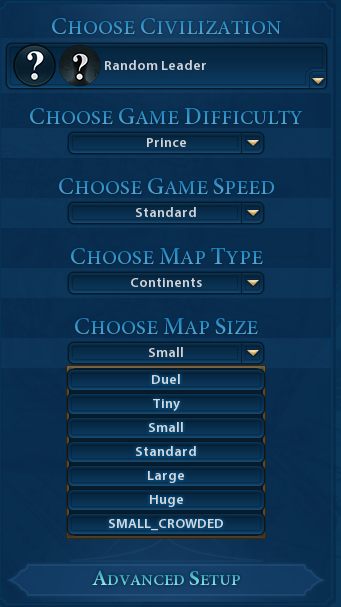 Map Sizes section allows to add custom map sizes to the game. Create Map Sizes like 20x20, 100x200, 160x160 tiles. Select number of city states. Select number of natural wonders. Easy to modify preset values from original game. Unlock settings by checking "Experimental settings" checkbox. 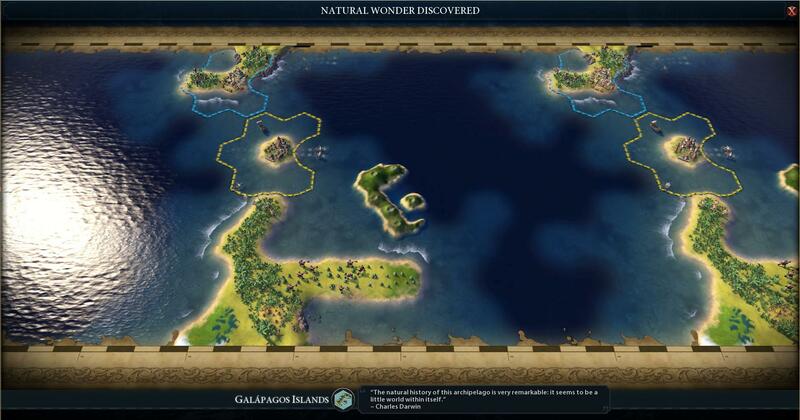 It will allow you to go outside of normal settings to facilitate mods that increase number of civilizations, city states, beliefs etc. It will also allow you to unlock map sizes greater than defaults. They might or might not work, depending on how high you set it up. Once in game you can find your new map size in selection screen. Map Scripts section allows to add custom map scripts to the game. 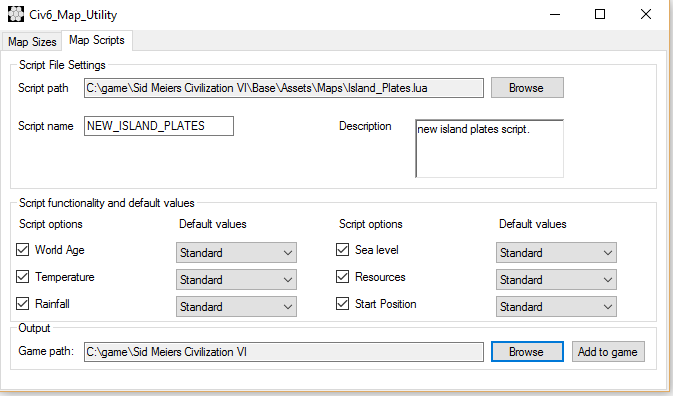 Adding map scripts with Civ6_Map_Utility is easy. Select path to the script you want to add. Set new name for that script. Set description for that script. In "Script functionality and default values", depending on what functionality the script is using select wanted values and default selection. Those correspond to the game options like seen here. Select Game path to the root of the game. Press "Add to the game". In game you will see your new custom script. Unpack archive using 7zip (http://www.7-zip.org/). For Map Sizes - Modify default game settings or create your own settings for map sizes. For Map Scripts - Select map script to be added. Select functionality this script supports. 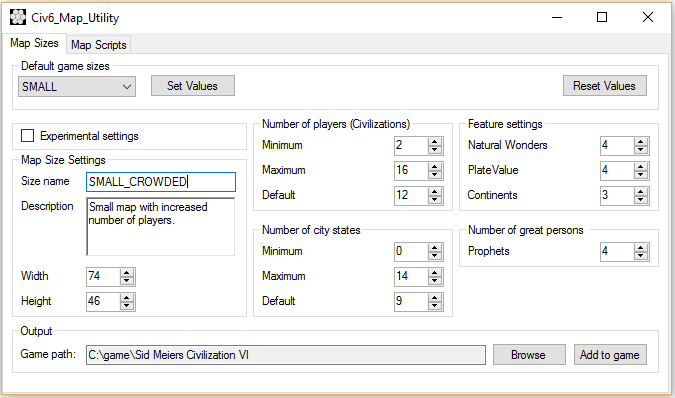 Click "Browse" button to select root/main directory of "Sid Meiers Civilization VI" game. - In case of steam it usually is: "C:\Program Files\Steam (x86)\SteamApps\Common\Sid Meiers Civilization VI"
Once happy with settings for new map size press "Add to Game" button. Load Sid Meiers Civilization VI game and enjoy new functionality. Go to "Sid Meiers Civilization VI" directory and remove following directories. Go to "Sid Meiers Civilization VI" directory and remove following directory. Minimum, Maximum and Default values are described within TOOLTIPS- they can be read by hovering mouse over text. Experimental settings need to be tested by community and can be enhanced with use of other mods. If your game crashes, try different settings. I am unable to test all of them. I ask you guys to help figure out what works and what does not. 2. Map sizes are not the same as map scripts - map scripts determine spawning of the world and as such, there is no guarantee that the map size selected will work well with your script map and player number. You might load the game and see no players or starting position as game was unable to find a suitable place for you to spawn. Reloading the map/script usually works, however this again I cannot predict. If you are able to provide additional information regarding values and ranges. If you have an idea how to improve the application - visually or functionally. Please share it with myself and other community members within Utility's Discussion page. 1.Default settings for 'Huge' Map' have been set as 'default' values when loading the application. 2.Minimum and maximum values set to facilitate more sensible map size creation. 3.Minimum, Maximum and Default values are now limited by each other. 4. "Experimental settings" checkbox added to ignore sensible map settings. 5. "Reset Fields" button added to restore defaults from first load. 6.Tooltips updated with more relevant information. 7.Game path field set to read only to disable invalid path input. 8.Miscellaneous Layout and Label Changes. 9.Better Icon created and added to the executable file. 1.Rebuild the Civ6_Map_Utility.exe as for some reason previous version is getting flagged for malicious code. No real changes made, but this .exe seems to work fine. 1. Minor cosmetic layout changes to accommodate new functionality. 2. 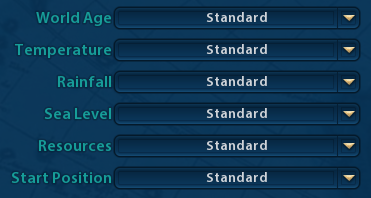 Default game sizes were added in form of presets. 3. Significant progress was made to the Map Scripts Section, however it stays hidden until fully functional. 1. Map Scripts section added to facilitate easy installation of game scripts without modifying existing xml files. 2. Confirm overwrite yes/no popup message when files already exist - implemented. I love this tool you made, I have to play with it more. 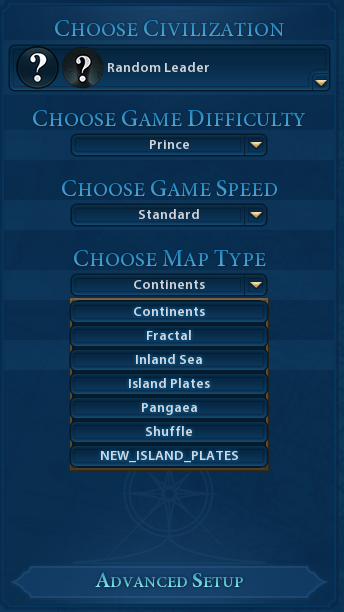 It be nice to include in this tool a way to select if you desire to have land masses for each civ of its own. 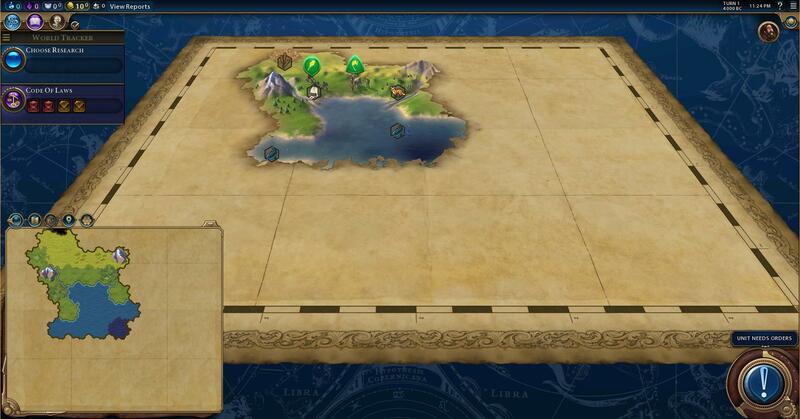 10 civs to play against 10 land masses. 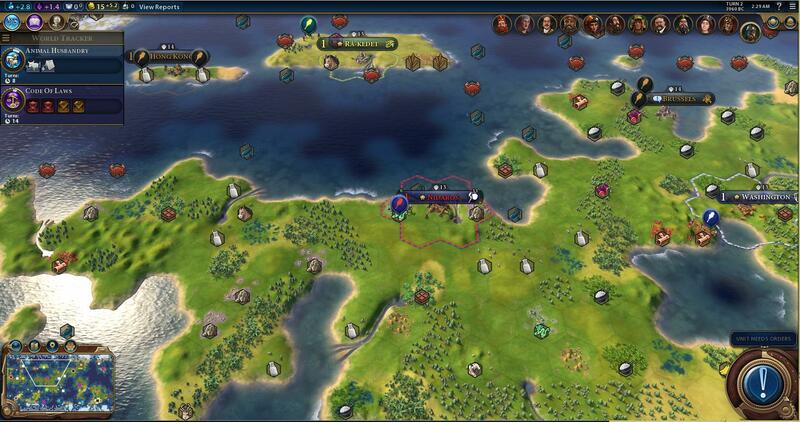 This is for those who enjoy building an empire before meeting other civs. Thanks for the review - glad you like it. To address your feature request. I believe the exact spawning of players/civilizations is handled within actual map scripts. My tool does not address that issue as that would be a very specific 'map type script - like continents.lua or island_plates.lua' instead of a general use tool to add those scripts/map sizes. Perhaps as I learn more about how the game works, i'll figure some fancy script generator algorithm but for now I believe it would have to be crafted specifically for your request and unfortunately I do not have plans to create scripts right now. Easily add map sizes without directly altering XML. Easy to remove sizes too.